It's not yet clear if Salem the dolphin, who was found in St. Pete, was harmed by the state's red tide bloom. A Bottlenose dolphin found stranded on Halloween is now swimming on her own, but she's still not out of the woods just yet. A boater spotted her off the north Sunshine Skyway Bridge fishing pier in St. Petersburg. Salem, as she is being called, was rescued by the FWC Fish and Wildlife Research Institute. 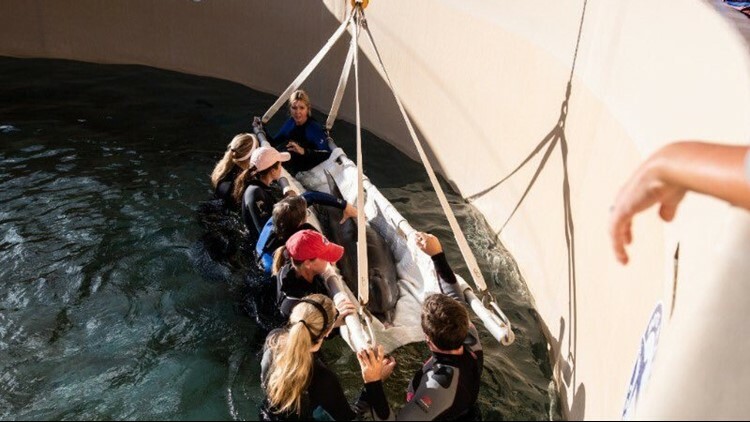 She was taken to Jane's Refuge: The Hospital for Dolphins and Whales at Mote Marine Laboratory. According to Mote, Salem was breathing quickly and arching her back while being transported to the medical pool, where she is receiving around-the-clock care. She has superficial shark bites and appeared thin. Marine mammal specialists say she is still in critical condition, and they're treating her for an infection and parasites. Blood samples were collected to determine if she was affected by Florida's ongoing red tide bloom. Salem is approximately eight feet long and weighs 325 pounds. If you see a distressed animal in the water, call FWC's Wildlife Alert Hotline: 888-404-3922.